Pattern addition 12. Nov 2013: Thanks to Véronique Giovannangeli a French translation of the pattern descriptions is available for download. For the charts please also download the English version. Pattern update 30.03.2012: some minor changes in the pattern to facilitate blocking and addition of a left side chart to avoid problems with mirroring. ATTENTION: Please do not mix the old version of the pattern with the new because it is a bit different !!! The leaf motif is similar to nightsongs, lyra … but smaller in size. 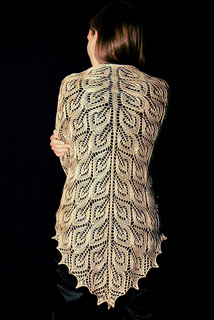 The backbone consists of purl,knit,purl and yarn over lines curve around some edges of the leaves. A 150g skein of the lighter gold sea silk (654 yards) knitted with 3,75 mm needles was enough to get a reasonable size: around 35” (90cm) from top to bottom at the midline and 63” (160cm) wide at the neck. 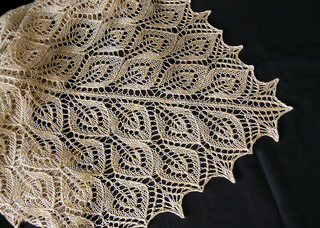 The darker gold shawl is knit with 80g tussah silk and 3,5mm needles; size 85cm x 170cm. 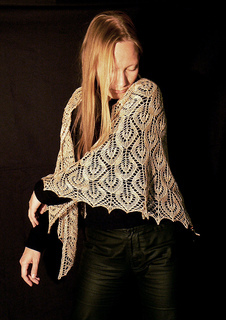 But of course you can make the shawl as big as you wish by adding more repeats :).